Getting other people to refer people to you massage business is one of the best ways to build a business. Your current clients, other local businesses, doctors and other health care providers are all potential connections in building your referral network. It just really takes a few good connections to make this work. It also involves having a good website that gets found for your main keywords – massage your city. 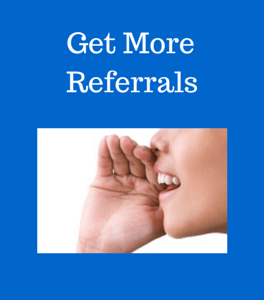 What does a website have to do with referrals? When people find your website through searching online – they are already looking for massage and there is a good chance that they already understand and value massage. People like that are more likely to just refer people to you without having to offer them things in exchange for the referral. That’s the main goal really – getting your current clients to refer to you without having to give them free sessions or points or whatever. That is also the definition of an ideal client- they will refer to you without incentives! They get up off the table and go back to their offices or home and send everyone they know in! So once you get them on the table you of course have to give that extra-ordinary massage! They need to feel better and see results! People like that will go out the door and tell the people in the elevator about you! They will tell all their co-workers, friends and family members. That’s a natural referral network! It just happens on its own! It happens because you give the most amazing massage and you listen more than you give advise. You make people feel comfortable and you make them feel better in their body! It happens because they are your ideal clients. We do also have the new shopping concept that everyone has a discount or members card and that could help your business too but don’t do that unless you find that people aren’t referring to you. You also need to ask people to refer to you – (I heard you gulping from here!) When your clients like you, they will gladly refer to you. Many will assume that you are busy because you are so good and won’t think to refer. It is OK to just outright tell people whatever is going on. I am getting out of the insurance business so I if you know anyone at your office or your wife/husband/family member who might need a massage -send them my way if you could please! Thank you! I am just starting to work full time and am ready to see more clients so if you know anyone who could use a massage, here is my card. Asking for what you want is part of learning to be a business person and be a successful one at that. The other part of this if you are a sole proprietor, you really only need a few good people referring into your business. Many think that they need hundreds and feel overwhelmed by the idea that they will have to go knock on hundreds of doors or cold calling or whatever. You really want to focus on building a relationship with the people, businesses and health care professionals who are most likely to refer to you – a massage business. But here is the thing that many really miss out on. Networking is not just about going to an event and handing out business cards. You really have to learn the art of listening and referring to other people first! People really are only out for themselves – just like you might be when you think of going to a networking event or doing networking. When you do that – people really won’t care. They will just put your card away and maybe once in a blue moon they might think of you for some special situation but getting one referral a year is not going to really help your business. People want to know what is in it for them. When you go in with the idea that you want to get to know people first and you also want to really see if they would be a good match for your business. A chiropractor who says something like “muscles are not usually the real problem” is probably not the best source of a referral. You want quality referrals from people who value and appreciate massage. Start with your current clients. Look to see who is referring people to you. Check to see if they haven’t referred anyone to you. Talk to both of them and then ask! Look for doctors in your area with a similar philosophy on healing and health. Chiropractors are a good place to start but many chiropractors will usually have an employee working there that does massage. Other good sources are physical therapists, orthopedic doctors, sports medicine doctors and general practitioners. Other alternative health care providers like acupuncturists can be a good source. Your business neighbors that you frequent often: closest neighbors – the deli workers, the ice cream shop workers, your favorite lunch spot, the grocery store checkers. Figure out a way to get to talk to them. Find out about THEM first! Go to them as a patient. Send people to their shops or stores or to use their services first! Getting doctors to refer to you. Are your referrals getting to you?